Fantasy and reality meet in a poignantly written novel laced with wicked humor. This is the story of Myrrh, unhappily married, depressed and addicted to pills and cigarettes in the throes of a mid-life crisis with tortured family dynamics. 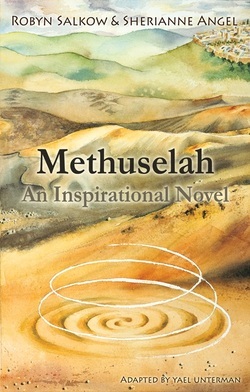 As Myrrh reaches breaking point, Methuselah enters her life and expertly draws her out of her cyclical isolation. Applying her dreams as a guide, this wise old man leads Myrrh on a journey of self-discovery and transformation. This novel has multiple themes. The main theme is an in-depth look at how individuals tend to repeat the same mistakes over and over again, running around in circles which keep them stuck, and paralyzes emotional growth and spiritual maturity. For civilization to keep up with fast moving modern technical advancement, we need rather to move in an upward spiral - each time growing a little more, each time expanding our consciousness a little more. Methuselah is fifteen chapters long, each parallels a place where a specific event occurred, each corresponds to healing a particular flawed character trait within ourselves. By tracing the process of the fifteen journeys, we are taught strategies and techniques that will empower us to change for the better. This inspirational book reveals the 15 secrets to self mastery.